Only LeGoût® Cream Soup Base is endorsed by the Master Chefs’ Institute™ for superior heat performance. Scratch white sauce can scorch. Modified corn starch, palm oil, maltodextrin, buttermilk, corn syrup solids, sugar, salt, buttermilk powder, yeast extract, soybean oil, onion powder, potassium chloride, natural flavor, disodium guanylate, disodium inosinate. Contains: milk. An invaluable asset for any kitchen, LeGout Cream Soup Base delivers exceptional performance and versatility that chefs can trust. This instant soup base withstands heat and resists breakdown better than a from-scratch base, making it ideal for preparing alfredo sauce and tackling other demanding recipes. With its smooth, rich cream texture and delicious flavor, it is ideal for creating savory cream soups, white sauces, casseroles, chowders, and more. The vegetarian cream soup base prepares in minutes; simply blend the soup mix into warm water, whisk until smooth, add other desired ingredients, and heat. To help minimize waste, this white sauce mix can be frozen and thawed for easy reuse. 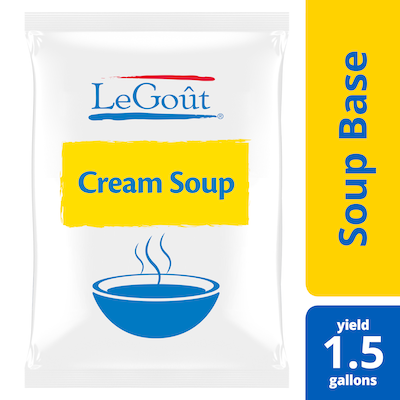 Legout cream soup base makes soups, sauces, dips, and entrees quickly and easily and is more stable than traditional cream reductions. This base is more cost-effective than scratch reduction and has no trans fat. Use wherever a rich creamy base for savory cream soups, sauces, casseroles or vegetable dishes is required.